Hi, I am interested in your 1977 Chevrolet Camaro (stock #0994-NSH) listed on Autotrader for $16,995. I'd like to get more information about this vehicle and confirm its availability. 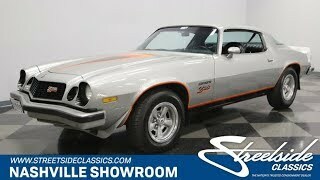 After a two-year hiatus that had Z28 fans lamenting the loss of a potent drivers car, a surprise announcement was made in early 1977 that the Z28 would be re-introduced mid-year, but not just as an RPO engine option. It would become its own specific model. True to its heritage, it would have upgrades to the engine, but would also focus on suspension improvements and styling enhancements. People jumped up and ran to their dealerships to get dibs on one of only about 14,000 that would be produced that year. This is a two-owner, numbers matching car with documented mileage. Check it out. This car is presented in the factory correct Silver Metallic with Orange and Black stripes. A mid-life respray kept the colors correct, but in the process, the vinyl stripes on the hood and the Z28 badging were recreated in paint. It still looks great and holds a shine well. This was the last of the uncovered bumper cars before switching to the soft nose look and that dictated a deep chin spoiler that was unique to the year. The factory blackout treatment looks great on the grill with the Z28 badge in silver and orange as well as in the headlight and marker light recesses. Window trim and light bezels were anodized black and the rockers as well as the back panel between the taillights were blacked out and trimmed in orange. The aluminum bumpers had a black rub strip and along with the dual review mirrors came painted in the color of the car. The black interior of this car is essentially unrestored original. The only change made was an aftermarket Alpine stereo in the dash, but the original radio is in the trunk. GM did a nice job with these door panels with pleating pressed into the upper section, a nice long armrest that is comfortable on long cruises and big door pockets in the bottom. A four-spoke steering wheel has a Z28 horn button and sits on a tilt column in front of a nice wood tone dash panel. The speedo and tach are clearly visible on each side of center with the engine gauges and controls symmetrically arrayed on either side of them. The upper dash pad is in great shape with no cracks and the odometer shows the 101,478 actual miles that are on this car. As this is an unrestored interior, there is a rip in the drivers seat vinyl from normal wear. The shifter for the automatic transmission is mounted in the center console that has a nice storage compartment and armrest also. As a Z28, this is a drivers car, so the engine and chassis were upgraded in order to live up to its billing. The engine is the original, numbers matching unit with a Quadrajet four-barrel carburetor and an upgraded camshaft that bumped the power and torque a bit. An aftermarket air cleaner with a chrome top replaces the stock unit on this car, but the original one is in the trunk along with the radio. The only other changes are an aluminum radiator to keep things running cool and Headman headers with a 3 collector leading to Thrush glass pack mufflers for even more power and an awesome sound. The chassis engineers did a nice job by upgrading the springs and shocks both front and rear and adding a beefy front sway bar with matching rear bar to flatten out the handling. 11-inch vented front disc brakes assure good stopping power and the car sits on Kelsey Hayes 5-spoke wheels painted car color with 235/75R15 tires mounted on the rear and 215/75R15s in the front. GM resurrected this Z28 from the ashes of 75 and 76 to live again in the hands of just two owners. Ask your salesperson about the folder full of maintenance receipts. You might decide to become its third owner.